Events where your system resonated with subjects, objects, or activities which proved advantageous. Frequency-sensing events which allowed you to operate in the unknown as if from total knowledge based on frequency sensing. This is another category of events that may not be useful for examination by novices. Resonance is not intuition or gut-feel. It is frequency-sensing capability that is an advance of what is known so far in dolphins, porpoises, whales, and bats. It goes beyond echolocation. It is a capability that will be increasing within the human species. If you can recall high school physics, tuning forks are used to explore frequency. A common experiment is to use two tuning forks with the same frequency. If one tuning fork is struck, the other will begin to vibrate in sympathy with the first tuning fork to produce the same tone. 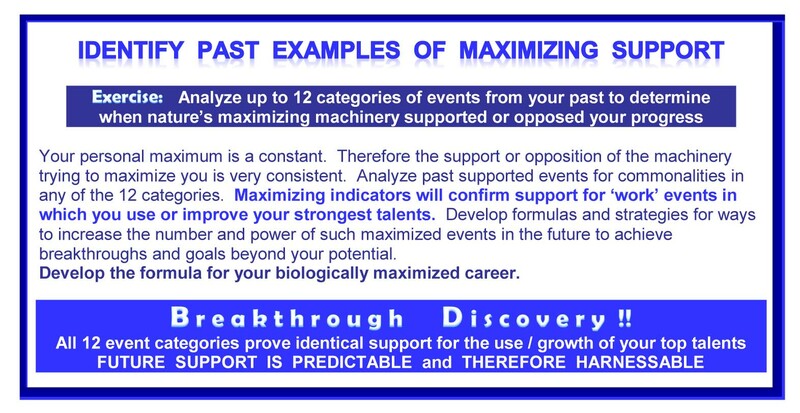 Resonance is experienced when you focus on an activity or item relevant to the ‘maximized you’ that the maximizing machinery favors. Just as with coincidences and sudden knowledge or creativity, resonance is a signpost which will help you to identify and join into the flow of synergistically maximizing and adapting living systems. Resonance is an indicator of something being on your current need to maximize. If you imagine yourself to be the first tuning fork, you will feel the surge of energy that you would expect when the second tuning fork begins to resonate. For example, look down your to-do list. The item to select as your next activity is the one which invokes the greatest frequency surge as if the second tuning fork is joining the tone of the first. This is the signal that maximizing mechanisms favor this activity from their superior knowledge of all of the living systems which are being synergistically. By using resonance you can operate as if you have all of the same information that nature does. Resonance is a phenomenal tool for frontiering™ into new unknown territory. It may take some experimentation to build a relationship with your resonance. However, it is well worth it. What parent would not want their child to have this means to remain safe? Resonance suits those people who do not like to do a lot of analysis yet want to be able to proceed at top speed in total compliance with the maximizing flow. There are no words or information associated with operating by resonance. You simply operate consistent with the frequency shifts or surges that suggest a second tuning fork is resonating with whatever you are focusing on.